Following London South Bank University (LSBU) joining the WeAreWaterloo Business Improvement District (BID) earlier this year, Gurpreet Jagpal will continue to build partnerships between LSBU and local businesses to further create innovative opportunities for LSBU students and graduates. 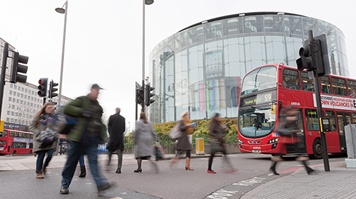 Led by 400 businesses within the boroughs of Southwark and Lambeth, the aim of WeAreWaterloo is to improve the area around Waterloo Station as a place in which to work, visit and run a business. As a member of the BID, LSBU has transformed the lives of South Londoners and supported the local area through business partnerships, job creation and start-up support. Over the last year, the REI team led by Gurpreet, and based at the award-winning Clarence Centre for Enterprise and Innovation has created 89 jobs in the local community via tenants and our Investment Escalator Programme. The department also runs free business support initiatives for local businesses, such as the Momentum accelerator programme and the Business Solutions Centre, a drop-in business advice service staffed by students. The BID is currently leading on a new incubator space for architects and others in the built environment sector which will form close links with students and academics at LSBU. Build Studios is a purpose built co-working, hot-desking and events space on Westminster Bridge Road, opening in in December 2016. WeAreWaterloo are also involved with some of LSBU’s enterprise programmes for students and graduates, led by the Student Enterprise team. At Business Solutions Bootcamp, LSBU students presented their ideas for increasing weekend footfall around the Lower Marsh Market area to a team from the BID. Find out more about LSBU's enterprise activity at the Clarence Centre.